When it comes to love and dating, making the first move can be really, really nerve-wracking. I get that. When you’re interested in someone it’s easy to give into your anxiety (“Should I text him first? What if he/she doesn’t write back? !”) instead of taking action. As a person who is anxious in general, I can totally relate to this. However, the truth is sometimes the smallest actions can lead to really big, amazing, life changing things. Whether that’s sending someone a message online or working up the courage to finally text that cute person you met last week, the small chances we take have the potential to pay off in big ways. This is definitely the case with Steven Kawalit and Nafiz Joon, a Canadian couple that recently got engaged thanks to the help of Facebook. Their love story began when Steven 32, a Toronto based digital manager, built the courage to ‘poke’ this beautiful girl who showed up in his Facebook News Feed. That beautiful girl was Nafis, a 31 year old dentist also from Toronto, and the rest is history. Fast forward six and a half years and Steve wanted to plan an epic proposal for Nafis. He reached out to Facebook and asked if he could propose to Nafis at Facebook headquarters in Menlo Park, CA. Facebook was on board and excited to host the couple. They decided to set-up a fake tour of the office that Steve had won through a fake contest with the plan being at the end of the tour Steve would get down on one knee. 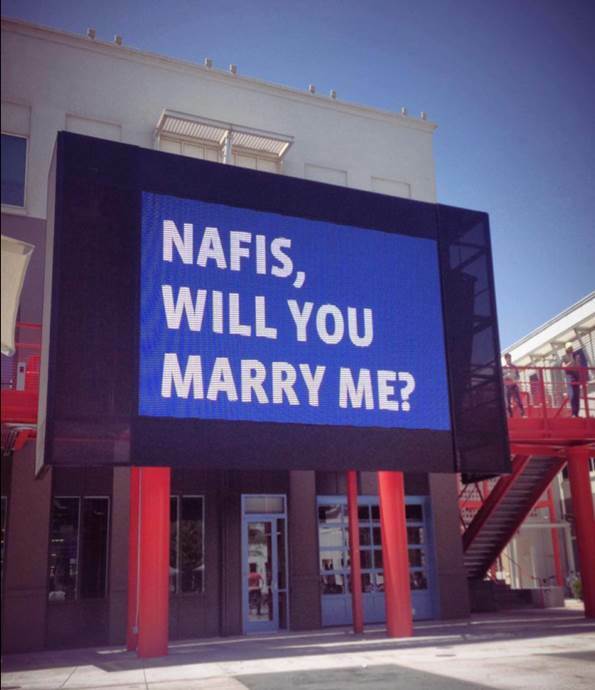 The incredible proposal happened on June 23 2014, and of course Nafis said yes, with Mark Zuckerberg and Sheryl Sandberg present to make the experience even more memorable. Don’t believe me? Watch their ridiculously adorable proposal video (complete with cameo from Mr. Zuckerberg himself!) here. Why am I sharing this with you guys? Because I’m a firm believer in taking chances when it comes to life and love – even if there’s the potential you might get shot down. I believe it was a young Keanu Reeves who once told a ramshackle group of baseball players something like, “One of the most important parts of life is showing up.” You can’t expect to find love if you don’t take risks and put yourself out there. I read another quote recently that said that “life begins at the end of your comfort zone.” Even if making the first move doesn’t lead to anything, at least you took a step towards going after what you want – one of many steps that will eventually get you to where you want to be. In other words, you showed up for your own life and for that my friend, you deserve a massive high-five. It’s time we all stopped playing on the sidelines. So, here’s my challenge for you this weekend: Write that message, say hello to that person with the cute profile and ask for that date. Show up for your own life. The truth is we never really know what’s going to happen. Take it from Steven Kawalit, today might just be the day that a simple action turns into something monumental.